Foster Manufacturing produces fittings, quick disconnects/couplers, air hose, blow guns and related accessories for use with various gasses and liquids. The most common applications for Foster Manufacturing products are for compressed air, hydraulic oil and water. 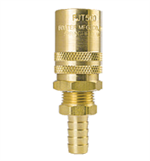 Foster Manufacturing fittings and quick disconnects/couplers are known for their interchangeability with other brands of industrial fittings and quick disconnects/couplers. Foster Manufacturing offers a complete line of Polyurethane and Hytrel Recoil Hose as well as the Fittings, Compressed Air Blow Guns and Accessories that go along with them. In a Foster One Way Shut-Off Quick Disconnect, only the socket has valving to shut off the flow when disconnected; it is, therefore, installed on the pressure side of the line. The plug has no valving and exhausts the downstream line at disconnect. Foster Straight-Thru Quick Disconnects, as the name implies, do not have valving in either the socket or the plug. Therefore, both ends of the line are exhausted at disconnect. Foster Two Way Shut-Off Quick Disconnects provide valving in both the socket and the plug, thereby shutting off flow at both of the disconnected ends.